At first glance this question might look like a duplicate of this one: How can I intensify the orange flavour in orange cake? it isn't. I'm making this cake for the second time:Orange Olive Oil Cake but I'm giving it a bit of a tweak and could use some advice regarding the tweak. The recipe calls for two whole oranges, quartered, peel and all. The oranges are to be brought to a boil and drained twice, then simmered in syrup until the rinds are tender. Then the solids are drained from the syrup and pureed in a food processor, the batter is then mixed in the food processor with the orange puree. The first time I made the cake I followed the recipe exactly and fell in love with its texture. I also loved the way the olive oil came through as an aftertaste. 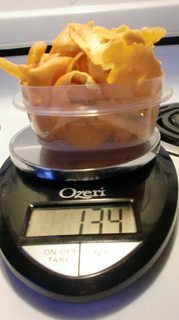 Unfortunately, my oranges lacked flavor and had very thick rinds. I knew going in that the orange flavor component of the cake was going to be lacking, and I was right. As far as orange, all I could really taste was the pith. I assume the original recipe calls for rinsing twice because the whole rind (including all of the pith) is included. Because I used a peeler, not a zester, I do have some pith, but not nearly as much. Towards the end of the cooking of the puree I plan to add a couple of peeled oranges. 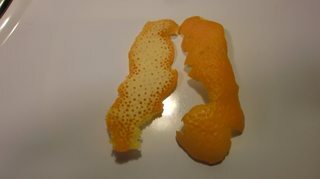 No matter how I treat the peels, I think I can guesstimate to get the volume, consistency and level of sweetness I want. I need the peels tender enough to puree, I'd like to eliminate as much of the pithiness as possible, but I don't want to pour great orange flavor down the drain. I'm not even married to the idea of boiling the peels, I'd love to consider other methods.I want maximum orange flavor from these peels for a very flavorful cake. Any advice? The second take away is that the variety of orange really matters, many varieties are more flavorful than others and these are NOT the varieties most frequently found in your mega-mart. (which are chosen more for appearance than flavor--go figure) Valencia, Hamlin and/or Seville oranges would be good choices. Avoid NAVEL ORANGES! Having looked at your recipe ever so briefly I might suggest an experiment as well... take about an ounce of vodka or everclear and let that sit for a few days with orange zest and vanilla beans, filter out the solid and use this concoction in place of the vanilla extract. The orange oils in the zest are alcohol soluble and thus should provide you with a nice orange extract to intensify your flavor. (I have not tried this with orange, so this is pure speculation). Not the answer you're looking for? Browse other questions tagged cake syrup oranges or ask your own question. Bundt Pan for a Citris Olive Oil Cake?